After tomorrow’s Easter Egg hunt, you might be looking for ways to use up those hard boiled eggs. How about a batch of yummy chocolate chip cookies? 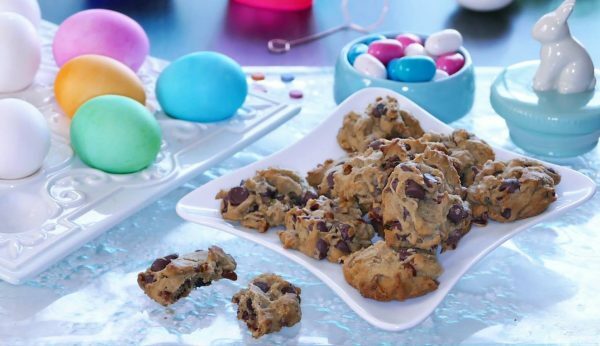 It’s no surprise that eggs are an important ingredient in most chocolate chip cookie recipes. But can hard boiled eggs not only substitute for fresh eggs, but in fact, make the cookies fantastic? That’s eggsactly what they’ll do! Mix this recipe up in a food processor or mixing bowl. I’ve also included some tips like browning the butter to make chocolate chip cookies even yummier. The incredible edible egg just found its sweet spot! Two of the largest family-owned egg farms in America are here in Arizona:*Hickman’s Family Farms has been family-owned since 1944 and is the largest shell egg producer west of the Rockies. *Rose Acre Farms Inc. is family owned and the second largest egg producer in the U.S. and the third largest egg producer in the world. * Water from boiling eggs is nutrient-rich and can be used on houseplants and in the garden. Combine flour and butter in a food processor or mixing bowl. Blend until mixture is the texture of small crumbs. Add the salt and baking soda to the flour and butter combination and mix until just combined. Add brown sugar, vanilla and boiled eggs. Pulse again or mix until mixture comes together. Add chocolate chips and walnuts, using a wooden spoon or clean hands to mix. Make 1 inch balls of cookie dough and place them on parchment lined baking sheets. Refrigerate for 30 minutes. When ready to bake, preheat oven to 350 degrees. Bake for about 12 minutes or until the edges of the cookies are lightly browned. Remove cookies from oven. Cool for several minute and then place on cooling rack. For soft cookies, place them in an air-tight container as soon as they have cooled. Makes approximately 32 cookies. If using browned butter, melt butter in skillet over medium high heat and simmer until butter turns amber. The melting butter will bubble and foam, so stir to check for amber color. Pour into bowl and freeze butter to re-harden. When hardened, combine with flour in the processor or mixing bowl.